Celebrate your young player's efforts, improvement and success with the blond girl basketball personalized Christmas ornament that is authentically styled and very perky too! Your favorite female hoopster from elementary age through high school will love these girl basketball player ornaments personalized with her name and the year lettered by one of our artists where shown but in a very attractive font to create a keepsake that is one of a kind. These personalized basketball gifts arrive ready to display in our plush and pretty velvet drawstring pouch that works well for storage too. 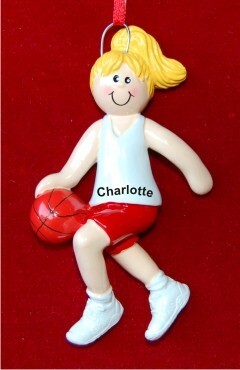 The blonde girl basketball player personalized Christmas ornament is fun to hang on the tree, and some girls like using it as a charm on their gear bags too!